Japanese Episode DP 033: "I Like It! The Pokemon Transformation Convention!!" American Episode 497: "All Dressed Up With Nowhere To Go!" 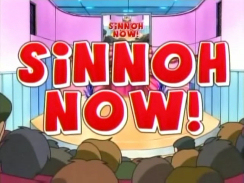 It's time for Shinou Now's Transformation Convention! The popular talent show features pokemon dressing up as other pokemon, and the prize this time is a mysterious pokemon egg! Satoshi-tachi and Musashi-tachi enter, each showing off their pokemon. Takeshi's Gureggru gets big points for its Nyorotono impersonation, but Hikari's Potchama loses a lot for using a Bubble Beam attack while in its Beedle costume. 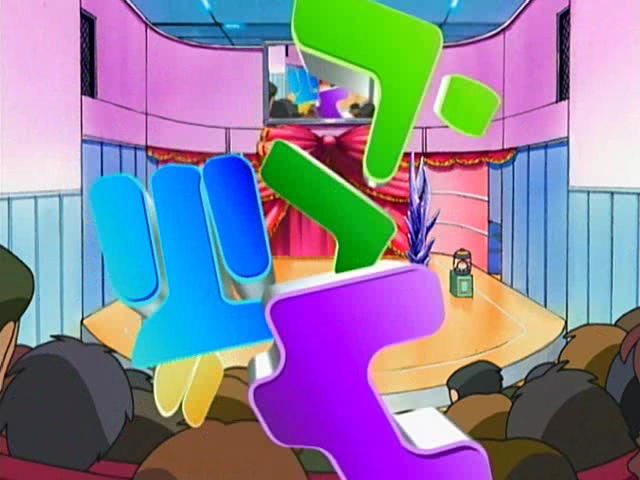 Musashi and Nyasu take the stage next, and the duo impress the judges when Nyasu imitates various pokemon's cries. After Kojirou's and Manene's turn, Satoshi and his Pikachu come up next. 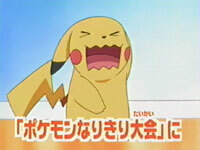 Pikachu is able to imitate a number of pokemon relying only on facial expressions, impressing all the judges. After a brief intermission, the second round begins! At this time, Nyasu notices that nobody is guarding the egg, so the Rocket-Dan steals the egg and make their escape. As our heroes try to retrieve the egg without damaging it, Manene uses a Teeter Dance attack in the heat of the battle, incapacitating its teammates and causing them to drop the egg. Once the convention prize is returned to safety, Pikachu sends the trio blasting off again. Later, the results of the competition are announced, and Takeshi and Gureggru are declared the winner! With a new egg in his arms, Takeshi and his friends continue on their journey, wondering what kind of pokemon will hatch. The Pokemon Narikiri Taikai, or the Pokemon Transformation Convention, is a really nice idea. Seeing various pokemon dressed up as other creatures is quite amusing, and the way they made Takeshi go ahead and win the whole thing was surprising. It's about time the character win a competition and get a pokemon egg after all his other traveling companions have had one. The dubbed version keeps a lot more Japanese music than usual (about nine pieces), so that's pretty exciting. There's a paint edit that I disagree with, but you'll see more about that below. The Guraena dressed up as a Suicune and the Doduo dressed up as a Dodrio both keep their Japanese voices. It's kind of weird calling this a paint edit since this is more of a CGI thing, but whatever. I've already expressed the reasons I think this edit is absolutely ridiculous over on Bulbagarden, so I won't repeat myself too much here. I just want to reiterate the idea that it's really stupid to edit out a language created specifically so we wouldn't have to edit it out. 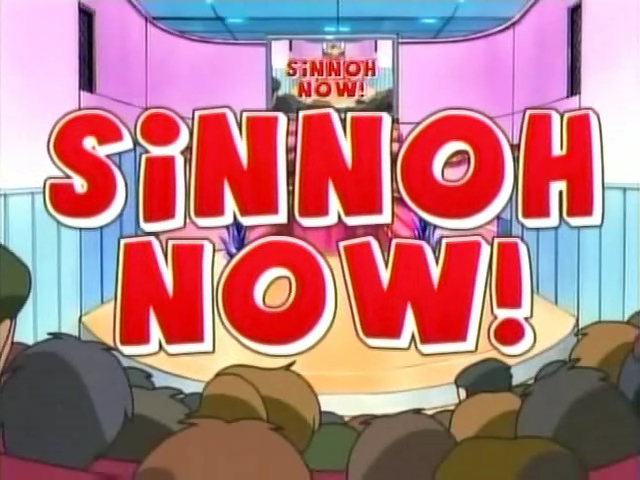 I mean, they even say the name of the show during this very screen, so what's the big deal? This is stuff you'd expect from 4Kids, not PUSA. Especially since PUSA has kept in every other case of this made-up language in the dub up until now. Plus, the Now part in the Japanese version matches the logo seen at the very beginning of the episode. The one in the dub, however, does not. Apparently, this edit was only for the TV version of the episode; the DVD, from what I hear, gives us the unaltered footage. Huh. Dawn: "Rule is, in a dress-up contest it's just one pokémon per Coordinator." Hikari basically says the same thing in the Japanese version with one exception; she doesn't mention the word "Coordinator." The dub makes the dress-up contest seem like a Pokemon Contest when it actually has nothing to do with it. Trois secondes sont...oh wait, I already did one of these in French? Darn. 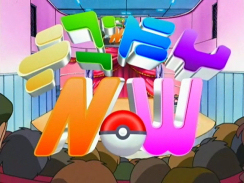 Well...three seconds were added to the dubbed version of the TO BE CONTINUED... screen.